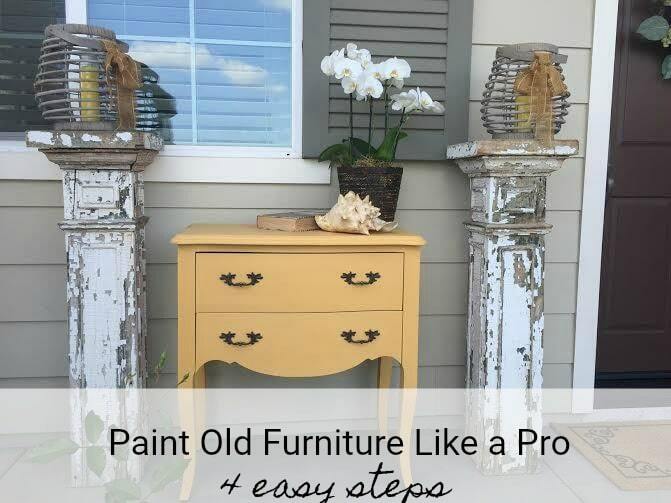 See how to paint old furniture like a pro with Chalk Paint® by Annie Sloan in 4 easy steps. The hardest part is choosing which beautiful color to use! I am a sloppy painter and an impatient one too. What I love about this technique is the minimal prep time, the paint is very forgiving, and the result is simply fabulous. 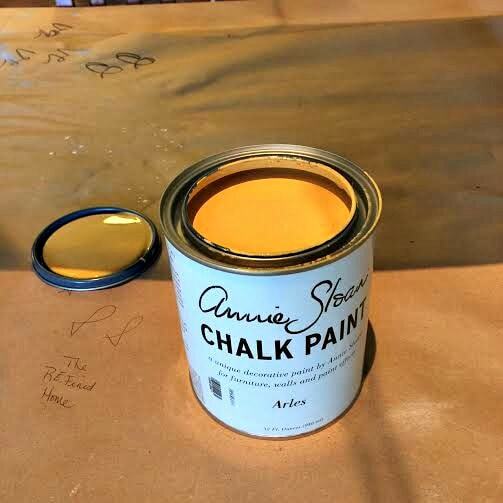 If you would like to upcycle old furniture and transform your home on a budget, you are going to love this tutorial on using Chalk Paint® by Annie Sloan. 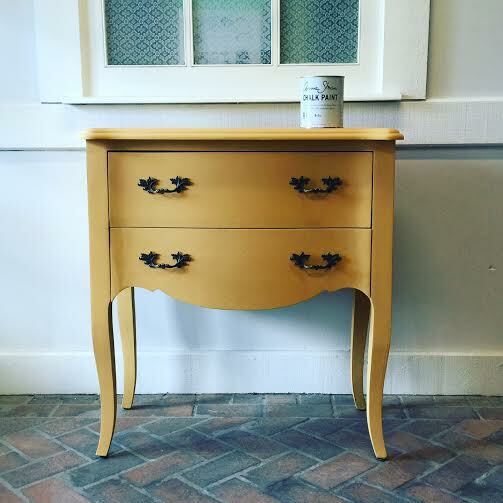 If you don’t have any old furniture to paint, check local garage sales or your favorite thrift store. You will often find us at one of the Goodwill of Orange County stores. Lisa Lee, owner of Vintage Home OC in Placentia, CA, has turned her love of thrift store finds into a thriving business. 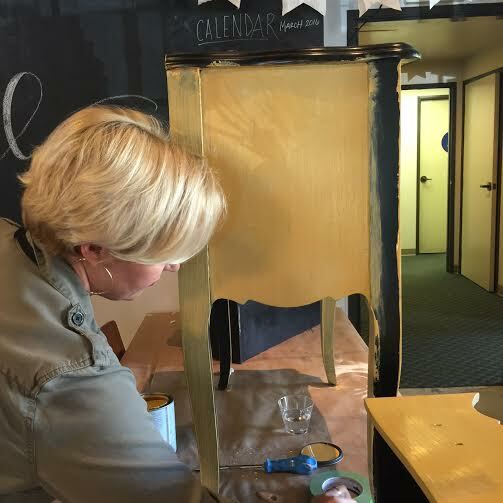 She shares her step-by-step for giving old furniture new life. She showed me how easy it is to give your old, scratched or just no longer your style furniture new life and a new look. I thought painting with Chalk Paint® was going to be tricky and time-consuming and it turns out that I was wrong on both counts! 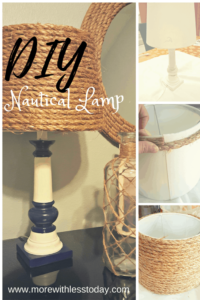 The color palette is so lovely that the hardest part for me turned out to be choosing the color for my table makeover. Some of the most popular paint colors include French Linen, Country Grey, Duck Egg Blue and a beautiful red color called Emperor’s Silk. I settled on Arles, this gorgeous yellow color. 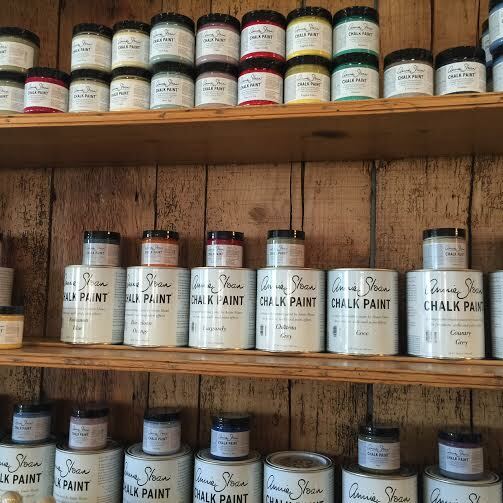 One quart of Chalk Paint®. 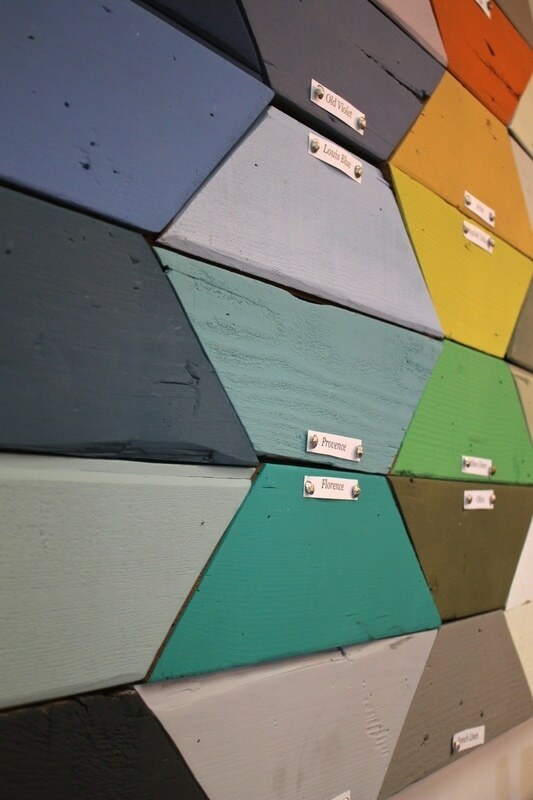 You’ll be surprised at how much paint is leftover to use on future projects! The paint also comes in a sample size which is enough to cover a chair or a small side table. A natural bristle brush for painting. Lisa walked me through this fun tutorial step-by-step. Surprisingly, there are only four easy steps. Step One: Dust off your furniture piece. The prep time for the furniture was next to nothing! Don’t you love that? It did not need to be primed or sanded. Lisa wiped off the dust and then was ready to begin. 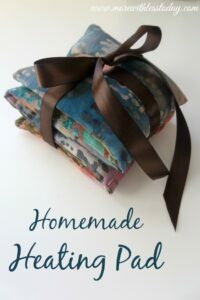 For an impatient weekend crafter like me, knowing this project could be completed quickly got me on board. Lisa started by using painter’s tape to tape off the inside drawers. She also removed the handles because those were in good shape and we were going to reuse them when the project was done. Tip: If your furniture hardware is not in the best shape, or not in a style you like, it is a very inexpensive fix to buy new hardware for your project. Step Three: Painting — multiple coats. Then we dove into the fun part — painting! Lisa worked quickly applying the first coat and just kept the brush moving. Time for the second coat! The number of coats needed depends on personal preference and the starting color of the furniture. Lisa said it is best to let each coat dry for 24 hours, but if you are in a hurry, you can use a hair dryer to dry each coat and then continue painting. For the finish, there are several types of wax that can be applied to give it that smooth professional look. I chose a clear wax for my piece. When your piece is dry, use a clean natural bristle brush or an Annie Sloan wax brush and apply the wax liberally. Once you have covered it, use your clean, lint-free cloth to wipe off any excess wax. The wax will seal and protect your painted furniture. It will harden when it completely dries. Another surprising feature was how little paint was used and how much was leftover for future projects. Don’t be intimidated. The entire process from start to finish was so easy and the paint is very forgiving. 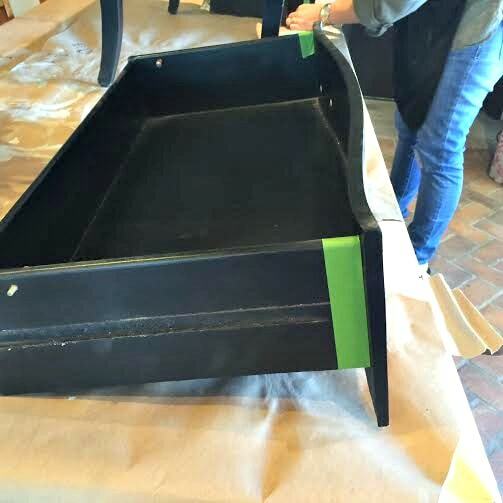 Unlike latex paint, you can easily go back over a section to thin out a section or apply a little more paint if needed. The first coat may look streaky with your brushstrokes showing. Don’t worry, the second coat will look dramatically better than the first coat. The furniture takes 21 days to fully cure so be careful if you place decorative objects on top. I would advise against moving things around until the piece has completely dried. I’m thrilled with how the old table turned out and cannot wait to find more old furniture to paint. 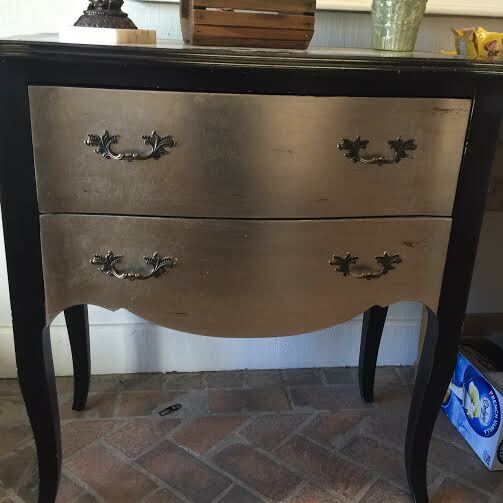 Do you have any tips to easily paint old furniture like a pro? 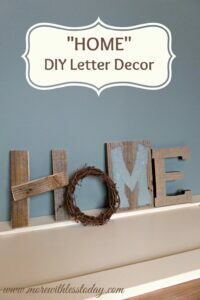 Join us on Pinterest for more DIY Ideas for a beautiful home.